You hardly need a reason to throw a good party. I’ve thrown plenty of them. From wanting to toast a new apartment to feting a friend’s birthday, from wanting an excuse to dress up, to gathering the group for Friday night dinner, everyone loves a celebration. It’s also good for business. On Thursday night, Yesware, the startup I’ve recently started working for, and Terrible Labs, another new venture down the street from us in Boston, invited 300 partners, clients, prospects, press, and job candidates to our office warming party. We wanted them to see not only where we worked, but also how we worked, and why they should join the team. We had the requisite open bar, complete with custom cocktails. The menu included the CRM Sync (think Long Island Iced Tea), the Custom Template (create your own, name it, and have the bartender track how many people order it), the Team Collaboration (a round of shots), and the Yestail (a green Midori sour). 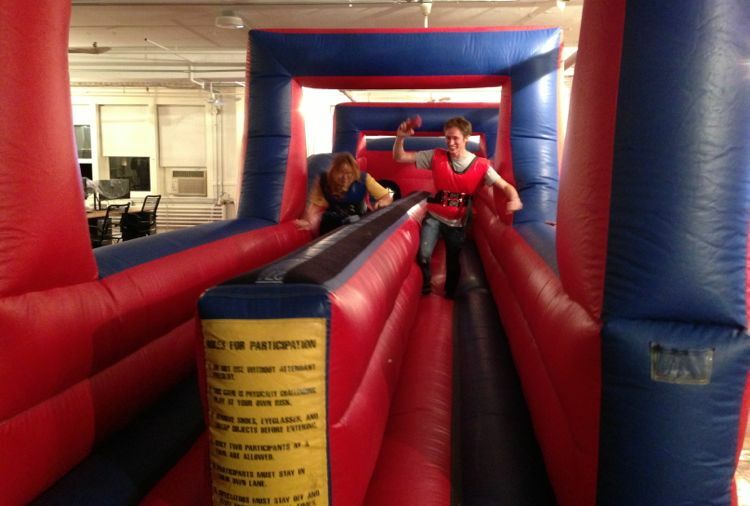 But we had something I hadn’t seen before, a bungee run —an inflatable, two person bouncing race track where you’re attached to a bungee cord, which feels like a rubber band that snaps you back into place as you try to outrun your opponent. It was probably the best ice-breaker I’ve seen recently. What was amazing to see was just how intensely competitive the run got as the party went on. It was as if people were competing for a job. And that gets into the heart of why you’d throw a recruitment party. Besides generating buzz to show your investors and potential future backers (like Highland Capital Partners, who were in attendance) that people are loving your product, that you can pack a room with clients and press, you want to show prospective hires that this company is a good alternative to the other options out there. Recruiting for startups is a tough task, especially when they reach a certain critical growth point. There are other complications too. First, companies need a range of people from junior to experienced professionals, but they seek fresh points of view and new approaches to problem solving that often come with younger (read Millennial) talent. Second, due to cash constraints and the need to pour just about every dollar into the business, compensation is often a challenge. In my startup, we go to college career fairs. We’re lucky because in Boston, we have a strong talent pool to choose from. But even in schools like Tufts, Worcester Polytechnic Institute, Boston Startup School, and others, finding the right fit for our needs is no easy feat. We need specific engineers at a relatively senior level who are willing to take the risk of working at a new company versus the perceived security of working somewhere like Microsoft. Summing up one of his recruiting trips to a university a couple of weeks ago, our vice president of engineering said that while students were cued around the corner for the big players like United Technologies and Intel, they dribbled in around the startups, as if afraid to catch the entrepreneurial disease. But a closer look at the employment numbers tells a very different story. While month-over-month, national hiring is down 0.2 percent and the average paycheck was flat, according to national data released today by SurePayroll’s Small Business Scorecard, startups are aggressively recruiting talent. Yet candidates are still scared to make the leap. I know I was. But what’s surprising to me every day is just how normal it feels. I go to an office. I have co-workers. I don’t work in a vaccum. In many ways this is very much like working for a “real” company. Where it gets more challenging and more interesting is that over the course of three weeks I’ve managed to take on more responsibility and propose more initiatives than I ever would be able to pitch and work on at a traditional company. So on those days when I ask myself if I made the right decision, all I have to do is look at where I am now versus where I was last month. And then I look at the post-it that greeted us this AM. It said “lost skirt last night. Please call me.” That’s how you know you’ve had a great startup party. This post originally appeared on Upstart Business Journal.